It's the Finals, folks! It matters less now who wins this series, coz you are not saving up for anything anymore. We've been pacing this marathon, and now that the tape is near, it's time for a sprint. The Injury Factor. Athletes are still human. 82 games and 3 rounds of the playoffs are no small feat. Anytime between opening night and now, muscles get stressed and bones get chipped. The reason teams employ the best in sports health is because wear-and-tear is real. Nobody wants anyone to be injured, but **it happens. And when a part of the body snaps in an unfortunate situation, it's a player in the injury list. For our fantasy game, we should be wary of that. Of all the Cavs in our pool, Kyrie Irving has the greatest risk. With him missing time in last year's Finals, it's easy to be worried about losing the chance to pick him. The table below shows the percentage of us picking Kyrie in Game 1. I am sure a chunk of that 26% is based on this factor. The Home-Cooked Meal. 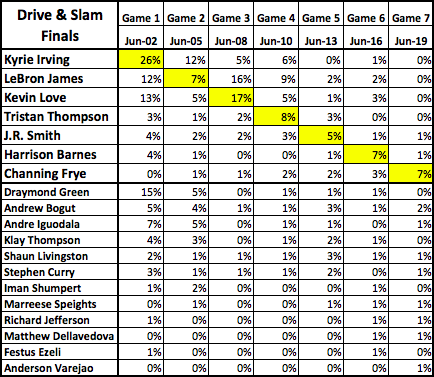 That 26% ownership in Game 1 for Kyrie is not all the story. 26% (and 12% for Game 2) means that more than half of us are waiting to pick him for a home game. Kevin Love's 17% in Game 3 and Draymond Green's 15% in Game 1 is a reflection of this. I just read an article the other day that assists (and blocks) are more likely to be higher at home. That's not likely to be true for all teams, but the Cavs are one of the top teams where that rings true. Assist-heavy Cavs Kyrie and LeBron suit well being picked at home in Game 3 and 4. The Warriors' Green and Shaun Livingston (coz noone has Steph Curry anymore) in turn are suited for Games 1 and 2. The Elimination Game. It does not reflect in the table above, but I am sure most of us are waiting to pick LeBron in an elimination game (if that happens). It's a perfectly sane logic. LeBron will be extra motivated to perform (read: triple doubles) when he is pushed to the edge of a ravine. I originally have LeBron for Game 4 (just in case we get a sweep) and he gets moved further as the series gets extended. I suggest you do the same. The Cold Pick. Regulars to this blog know this strategy all too well. For those new here, it's just the opposite of the "hot pick". So basically if you are lagging behind in your league's leaderboard (like I do), you intentionally avoid picking the popular nor the one that makes sense. You pick the unorthodox choice and pray that your gamble pays well. Besides, you can't overtake anyone who have the same pick as yours, right? So here is my modified pick plan for Games 1 to 4. Notice how this might not make sense.. at all..
OKC actually rebounded from their Game #6 total collapse better than expected and actually led at the half of Game #7, but a utterly miserable 12 point 3rd quarter sealed their fate, despite winning the 4th quarter of Game #7. They actually won 3 of the 4 quarters, but couldn't make up for how poorly they playing in the 3rd quarter of the finale. And with that, the Golden State Warriors move on to the Finals to take on the Cleveland Cavaliers, as most expected, at least before mostly everyone burned up most or all of their Golden State roster because of OKC's surprising upset of San Antonio and very near upset of Golden State. In the finale, best picks from the losing OKC Thunder were: Russell Westbrook (39 PRA) and Kevin Durant (37 PRA), both very sub-par to mediocre games for them. Also Serge Ibaka (21 PRA), Andre Roberson (16 PRA), Steven Adams (19 PRA) and Enes Kanter (12 PRA). I had Russell Westbrook (39 PRA), who was the high scorer from the losing and eliminated team, but it was still a very disappointing night from him, as he regularly goes past the 45-50+ PRA mark on most nights vs. most teams, including the Golden State team. So nothing to be ecstatic about here, plus I never did get to play Kevin Durant, although I do still have Stephen Curry for the Finals (and very little else), as Golden State looked headed for elimination in Game #6, but rallied and moved on to the next round. For the Finals, as mentioned I have Stephen Curry plus a couple of Golden State non-starting scrubs to go with my complete Cleveland Cavaliers roster available to mess with. So in Game #1, I will go with a Cleveland Cavalier player, despite Golden State being at home. I will go with J.R. Smith, who seems to do somewhat better on the road vs. Golden State than what he does at home. J.R. Smith had a 33 PRA road effort and a 25 PRA home effort vs. Golden State in his resume, but a more likely result is around the 15+ PRA mark, which I hope he at least manages to accomplish. Sorry Alycin. Just be careful next time, and have a pick way before tipoff. You created the pick 12 minutes before tipoff and were updating after. That may lead to confusion. Especially as the picks start getting locked near tipoff.